I'm going to fast forward through our Branson trip. I'll get back to the family reunion later, when I get more photos from my SIL. I can't explain it. I get a lump in my throat when I go to these exhibits and museums. 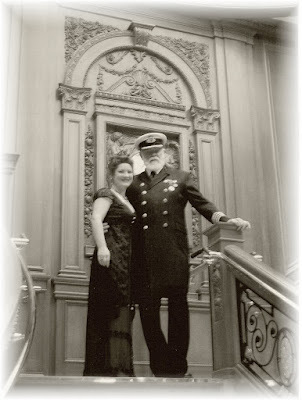 I make sure I'm doing something Titanic related every year on April 14th and 15th~ to pause and think about the lives lost and what the passengers endured. Not only the passengers, but their family and friends who were awaiting their arrival. As you all know, I'm obsessed with costumes. Especially period clothing. The edwardian era is one of my favorites with it's slim lines and empire waists. This year I was finally lucky enough to find a Sinking dress on eBay that looked presentable. (It is also known as the swim dress or water dress.) 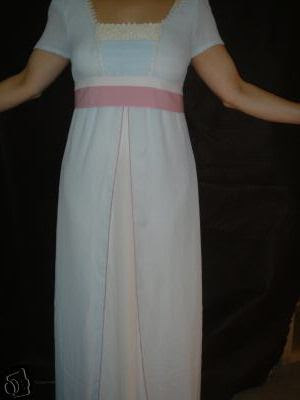 I have seen many repros, but most are made using the Simplicity 8399 pattern, which looks like a maternity dress. The fabric should not be gathered at the waist. Doesn't look too bad on the pattern cover, but the dresses I've seen made up really show the puffiness. (Same goes for the Jump dress!!) Here are some repros to compare. My favorite on that site is Jennifer Laconte's. 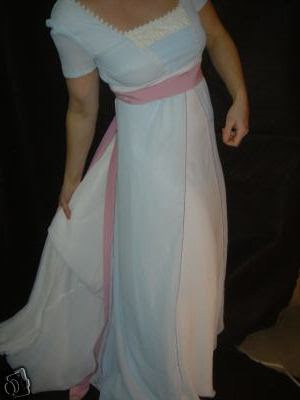 I'm quite happy with the dress I found, tho I do want to alter it some. For one thing it's too big for me. I've got it rigged up in the back for these photos. I want to change out the lace on top and add some beading. 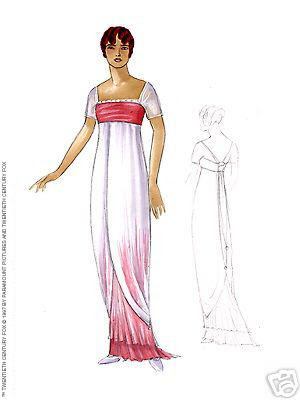 I'd also like to do some ombre dying to the panels, and change out the sash and cumberbun thingie for real tissue silk instead of the polyester. Still, I like mine even better than the J. Peterman reproduction! All of these things I wanted to do before I went down to Branson this time. But alas, I'm deathly afraid of my new sewing machine. It's two years old and I've never even threaded the thing! I'll tackle it one of these days. Kate wearing one of the originals for screen tests. Here is a sketch of how the original swim gown was to be. I really like this version, except for the bust area. I do like the use of pink velvet for the sash tho! This clip shows the gown made as sketched. Be sure to note how the screen version shown in the actual film flows behind Kate. I LOVE that. And I wanted you to see how mine flows too! There was a replica of the corridor in the museum, with a mirrored wall on both ends. I wanted to run thru there and watch my dress, lol...I *really* felt like Rose in that little area. Corny, I know. Photography is not permited on the *ship*. They will however take your photo in front of a blue screen, and then super-impose you onto the staircase, ect. Then of course they want some $$$. I chose not to buy them as I found out you can view them online. So here they are~ I asked them to take a pic of my back so it would look like I was walking up the stairs, they looked at me like I was nuts but they did it. I think it turned out pretty well! We couldn't talk the museum folks into letting me take real photos, but we did twist their arm last year. Only thing was, they took the pics and they all came back blury. I was so disapointed! I still bought them tho, I figured it was all I was going to get. The museum is really neat, and has some great artifacts. I love being able to see part of the ship they built and to walk up the grand staircase. The feeling is breathtaking. They will have Rose's Jump dress and sinking coat, along with several hats from the film there until December. If you are interested in Titanic Era gowns, esp. 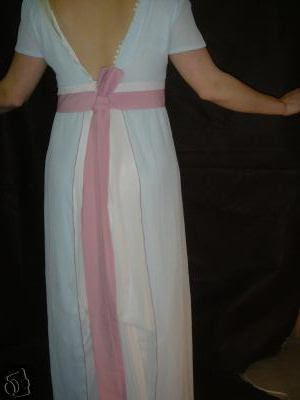 those from the film, this Titanic Dress group is for you. Speaking of Titanic dresses... 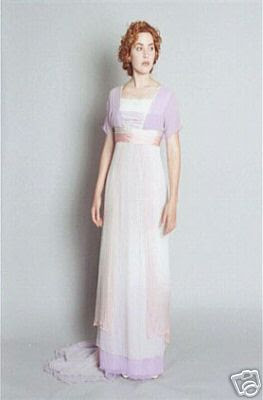 I love how Rue's wedding gown looks like Rose's *heaven dress*. And she looks gorgeous in it! Nikki I have to say, you are one wonky chick. I mean, bonkers! But I absolutely adore that about you! I don't know anyone else who would show up at a museum in period costume, and to match the movie! You go girl. You've got some ballies on you! You look gorgeous in that dress! How fun--and interesting! Great post, Nikki! I love the dress and you look gorgeous, as usual! Your hair even looks like hers! You look beautiful, as always! I enjoyed seeing the flowing dress in the video too! Glad you were able to go to something you enjoy so very much! Reading the other comments...I don't know, it looked like a perfectly natural thing to do, where else do you wear your Titanic dress???? And you looked beautiful, as always. 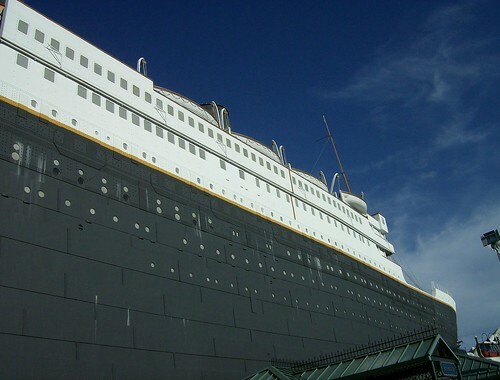 What I really wanted to tell you, though, was my reaction when I went to the Titanic exhibit in Florida...when we went out on the cold deck, and then through the next part or two, there were tears running down my face...I couldn't believe how it got to me. So I understand! Thanks, as always, for sharing! What a wonderful post. Your pictures are just gorgeous. I must get Titanic and watch it again. Your costumes are amazing works of art, perfect in every detail including the sumptuous fabrics that you use. Thanks for sharing you life with us. Nikki, The dress ...and your hair ...is gorgeous! You look better than the star! What a fun thing to do! I found your comment on Sweet Cottage Dreams and come to see your blog. I have Titanic listed as one of my all time favorite movies. I think your dress is lovely and I didn't even know that there was a museum. Huh! The things you learn blogging. I have been to the exhibit when it was here in town. LOVED IT! I would never have the nerve to do it unless you were holding my hand, but you looked gorgeous! I am going to have to see that movie one of these days!!! I LOVE your dress!!!!! You are too fun! What a wonderful opportunity- I would love the chance to go there someday! I know you must have had a wonderful time again. You look beautiful as always. Now, what are you going to where next year? You look incredible in that dress! Wow! I can sure believe they remembered you. I don't bet they have too many people show up in costume, but how fun! I love to see all those vintage costumes on you! I want this dress. Where can I get one like yours? ABSOLUTELY BEAUTIFUL! This is THE BEST recreation of the Swim Dress that I've seen so far! Some women made theirs tacky and gaudy looking, but YOU made yours look so authentic, tasteful, proportioned, and FAITHFUL to the original! Phenomenal! The only thing I'd work on is the belt. The original belt on the Swim Dress was an inverted "V" shape stitched onto the back - with two pieces of chiffon fabric dangling. That's the ONLY thing I'd change to perfect the dress! Other than that, the Swim Dress is brilliant!!! I love how you chose a light shade of blue instead of the original light shades of pinks and purples. Unique touch! Again, brilliant job and I'm looking forward to you making even MORE dresses from Titanic that Rose wore!